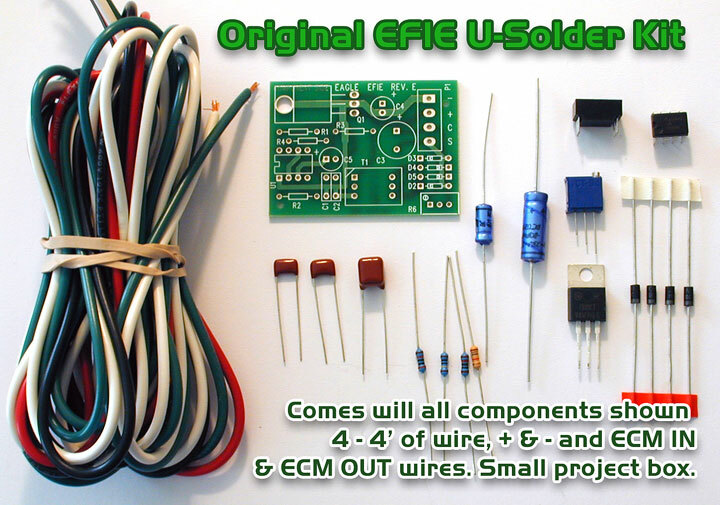 EFIE U SOLDER it up KIT. The original EFIE byGeorge Wisemen. Comes with small plastic box and velcro for easy install. Only hook up 4 wires. 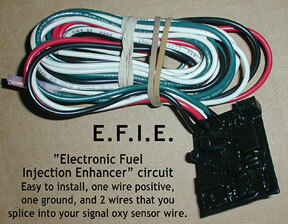 ( EFIE = Electronic Fuel Injector Enhancer) Good for OBDI cars and trucks (approx.1987 to 1995 cars) with single O2 sensors or two O2 sensors on each exhaust pipe. You will need to hook up 2. The EFIE tells the engine not to increase the gas when clean burn is sensed. The O2 sensor really only sense gas fumes, if no un burned fuel is not sensed, it tells the ECM to give it more gas to make it nice and stinky. No joke, the word O2 sensor is a mis-nomer. More info on EFIE is here. Also comes all soldered up and tested.